Why does everyone want to be contrarian? It is the best way for long-term investors to beat the market. You can be a trader of popular momentum stocks, but you need to be agile in your timing. Forget about what you read in the newspaper or see on financial television. This is what we call “old news.” People who appear are attempting to sound smart by telling you things that reinforce what you already know. Find a theme that is difficult to see. Contrast it with something that is easy to see. Look for the best (or worst) ETF choices for these themes. Single out the best (or worst) stocks in the sector. Verify your analysis with data! Often, the best way to explain an idea is to provide examples. Let’s repeat the four points above with our examples in mind. There is a daily media assault on banks. Government regulation is reducing profits. The yield curve is too flat. Energy companies might go bankrupt, and reserves might be too small. It is going to be 2008 all over again. [Old news – and also inaccurate]. The long-running quest for yield has induced investors to focus on dividend yield rather than the strength of the underlying investment. The yield is easy to see. The risk is not. The financial sector is attractive; utilities are not. Focusing on regional banks permits you to avoid some of the government attention to big banks and also minimize energy exposure. 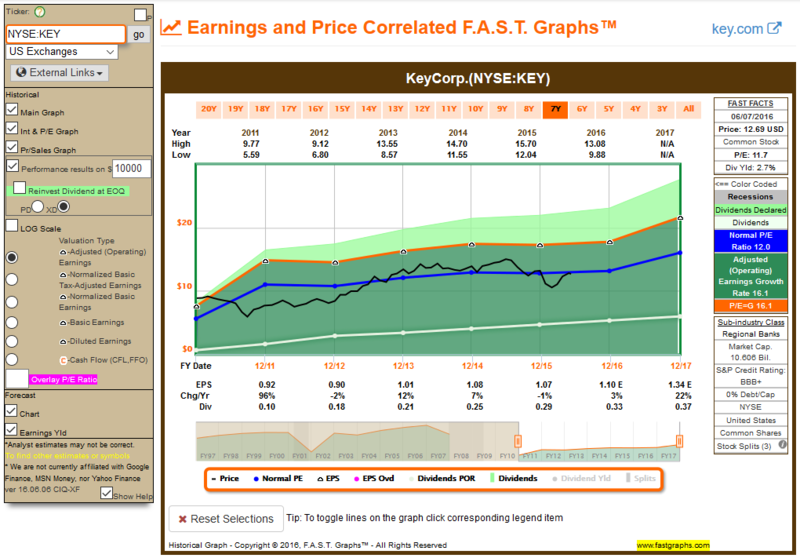 The regional bank ETF (KRE) is a good choice. By contrast, very bad sectors should be on your “sell” list. Utilities have rallied strongly in the reach for yield. The XLU ETF is the popular choice in this category, having risen to over-valued territory. We can now pick some attractive trading candidates. Due diligence starts (but does not end) with a trip to F.A.S.T. Graphs. Depending upon the stock and sector, you may need to dig deep. F.A.S.T. Graphs has plenty of additional information, but check out other sources as well. Since economic growth is under-rated and interest rates are likely (finally) to move higher, my long and short candidates both reflect this. Most people do not realize how far the quest for yield has stretched the valuations for utilities. Meanwhile, banks are hated. While we do not do short selling of individual stocks or ETFs in our programs, investors should be worried about utilities, including XLU. 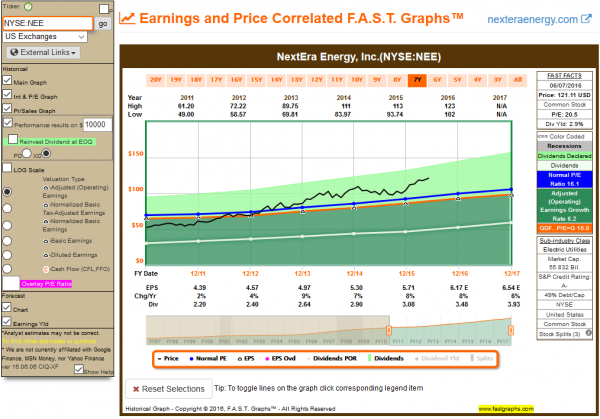 Check out the stock that represents almost 9% of the ETF — NextEra Energy (NEE) The stock has an earnings growth rate of about 6% and a P/E of 20. The yield is 2.9%, only slightly higher than our regional bank example. It is like owning a 100-year bond. Owners will get crushed by a modest increase in interest rates, as the stock price falls to maintain a yield differential over Treasury notes. Contrarian investing is not easy. You will not hear the TV pundits praising your stocks – at least not at first. You also would like to have a catalyst that will change the public perception. In this case, a small increase in interest rates will start the ball rolling. Only the greatest succeed in spotting where the puck is going. That is the challenge. If you aspire to beat the market, you need to think ahead! The first of your four rules advises people to ignore what they see on financial television because they will be exposed to viewpoints that simply reinforce what a viewer already knows. Then, in the course of making the case for regional banks, you relate that a leading investor on CNBC mentioned six banks out of hundreds and that three of them were already selected by you for investment. Perhaps I’m failing to detect some sort of nuance, but it appears you are unwittingly violating one of your key rules for contrarian investing. Would you mind clarifying your thinking on this matter?